Ok, let’s do the new promotions first. I’ve decided, as some of you may already know, that this is the year of the beads. I plan on promoting my wares every which way and the first part of that (aside from being vigilant on updating my social media (ie: Twitter & FB)) is to have actual outside advertising. So onto my favourite printing and merchandise website – Vistaprint – I went and set about designing a flyer and new business cards. The good thing about having a logo is that I can change the design of my cards as much as I like and so long as the logo is there, it’s all good. By which I mean, every time I’ve designed my cards I’ve changed them, as I haven’t found one which I feel is really ‘me’, one that fits what I am. until now. Funky pink flowers it is. And then I got to thinking and I have a car magnet to slap on the car whenever I go out. So they got ordered, and were delivered – they look amazing!! and cards and flyers went into my stockists. Only one problem. the magnets wouldn’t come in the same design as the cards. Oh well, they are still bright and look pretty good. Now, there is more coming. 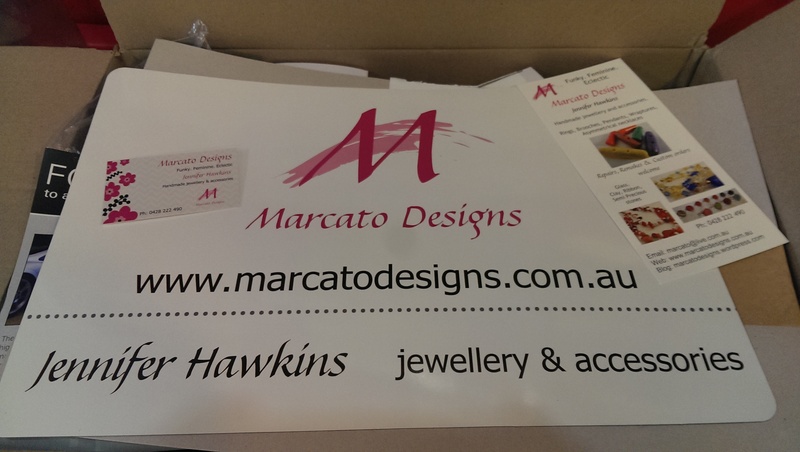 I got so excited about all this, and with the advent of another couple of big markets to attend, the options for bigger reach is just too much to bear.. so I ordered a large vertical banner and stand and as a bonus I get another mini car magnet – both of them with my funky flowers!! yay, super happy. Photos of these when they arrive. Saturday just gone was the annual Middleton Fair, perfectly located just 500 metres from my house. If it weren’t for the fact it was all down a steep hill I could probably walk my goods there (it would take a few trips, but the exercise would do me good). It is always a good day, no longer than any other market I attend when you take into consideration the set up and pack up times; but because it is all outside, there are 90+ stalls, animal nursery, band/s, displays, demonstrations, lucky ‘gate’ prizes, a great load of advertising and local gardening/cooking celebrities. This year was gearing up to be like any other except for one thing. The weather. Forecast to rain all day (it’s the middle of summer here, so not appreciated) it was going to be a hit and miss kind of day. Like many, I was very tempted to stay in bed and not go, but made the trek (expecting to be closing up early) and I was glad I did. Whole nearly half the stalls either came and left or didn’t bother even arriving, many people braved the weather and came along to visit. It was certainly not like last year’s hot day, but it could have also been bucketing down. I had a slow day, like most except the coffee and hot food people, and only made my stall fee + a small bit, but I know that all markets are different and considering the weather was pleased with what I did. I did get the details of a lady on Bruny Island who organises a couple of markets there, so will be applying to head over (with mum as she usually does them regularly). Mum and I shared my large gazebo (not quite twice the size of a regular one) and many people stopped and mentioned how sturdy ours looked and didn’t look like it was going to blow away. after checking the weather everyday in the lead up, I pared down my display so if it was too wet or windy I wouldn’t be chasing my goods all over, or having things broken. And it made it easier for a quick pack up should it be required – which was funny as it took me way longer to set up and pack up than usual. I now have plans for hiring two sites next year and making a full ‘room’ of my stall, making a full boudoir of awesome pink beadiness. Til next time, with more banners, magnets and new makes.. This morning I drove off up the road to see Rachel at BonneyBird to update and tidy my display. I may pay her a commission to sell my goods but it’s still my responsibility to make sure everything is looking ok, she is happy and there are enough jewellery items and choices on display. How could you not want to see what’s inside with an entrance that looks like this? When I went overseas late last year I invoiced her a small box worth so she had enough to keep it full – or top up if she sold that much – and today I got that box out to have a look. There were only 3 pieces left in it. Woo! My display is now tidy and fresh, with all items on the table. I re-arranged things and have a few ideas to zip it up another notch later on. Namely making it more of a pink and white display, with some extra height. When I called in the other day Rachel had placed a mirror on the table which was awesome as I had not thought of supplying one. The only problem here, it was for sale, so if sold, there was nothing for my potential buyers to check out how a necklace might look. So I delivered one of my own. I have my banner on the wall behind, and while I like it, I feel it is a little bland, and would like to update it. It hangs wonky, but I know how to fix that. And then I can update it. Banner wise, is to get a vertical banner for markets. Last night I went off to a garden birthday party and several things happened. My name was thrown around a bit with some of the guests not believing my name really is Jennifer Hawkins. Miss Australia, you say? no no no, Miss Universe thank you very much. But the important bits, 1) Rachel was there and said I had sold something else that very morning, 2) I got lots of compliments on the necklace I was wearing, 3) another customer was wearing her necklace which was getting lots of attention and I hence got the compliments and 4) a friend asked me how much a certain item was she had seen on Facebook and said she was very interested in it as a gift (and has since said ‘Sold’ for delivery this week). To say I am happy is an understatement. My new cards, flyers and the car magnet will be arriving this week ready for the big fair on Saturday, so there will be more pictures later. And I am super excited about seeing how they look! It’s going to be my year. I’m going to get in your face and push my jewellery. I have new business cards which are funkier and more in tune with me, flyers with pictures and a list of where to find me and the big one – a car magnet. 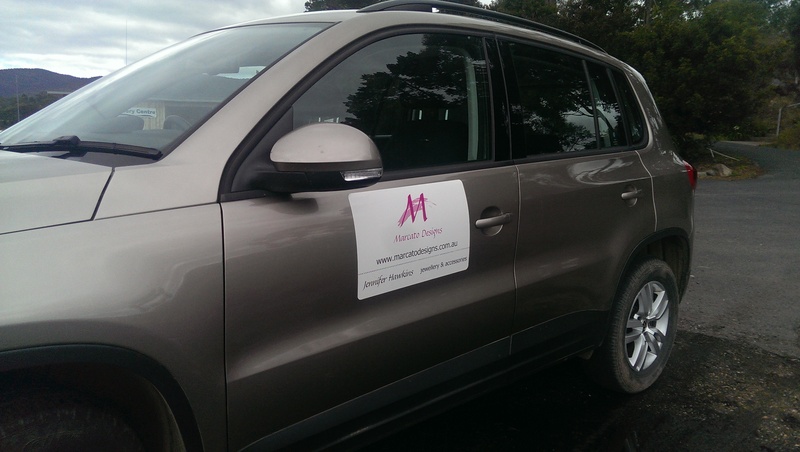 Drive around advertising. Gotta love it. I have 3 stockists currently, but will be looking for more to get in out there and as each place has their own vibe I can tailor their stock to their customer base. So far I have my place of work and two other small shops. One has just opened but the other two have been doing alright. One shop has bought them outright so I get paid while the other two have them on commission. Both work well for me. Buying outright means I get paid and can work on other things, but the seller then has to do the work to make sure they get their money back. Selling on commission means we both have to work on it. I’ll promote the s**t out their shop and share it, and for any shopkeeper – good service, reasonable prices and a welcoming atmosphere will get people back in. Bonney Bird, Electrona – a funky eclectic collection. 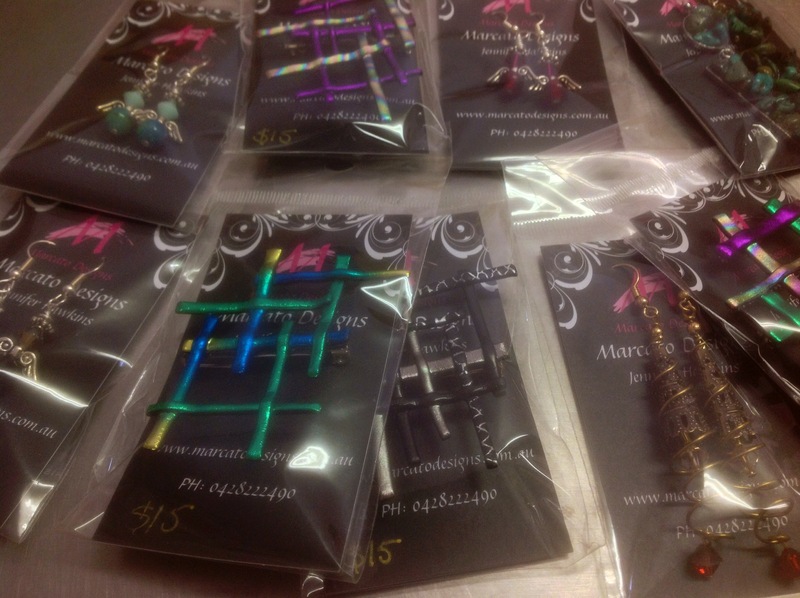 Hair clips, rings, necklaces and my limited edition Marca-ties – a bid style necklace of beads sewn onto a neck tie. I do need to pop in and give my display a spruce up, but the picture will give you an idea of what’s there. For local readers and tourists alike please check out these gorgeous shops and support local artists. You will easily find them right off the highway as you travel south of Hobart down ‘the Channel’ with stunning water views and passing through quaint villages. Enter your email to follow this blog and get my new posts by email.